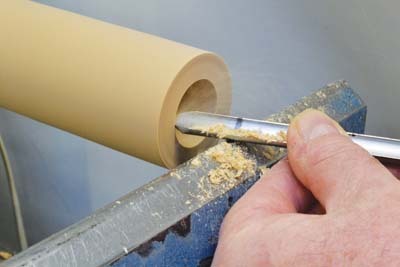 The gouge descriptively known as the shallow-fluted gouge is often more commonly called a spindle gouge, although it is certainly not restricted to only spindle work, as you will see here. A lesser-known use of the gouge is to bore holes, and since the tool is longer than most drill bits, this can be an important method for you to use. To do this, simply adjust the toolrest until the cutting tip is on centre with the tool horizontal. Next, you need to push the tool gently into the wood along the lathe's centre line. The hole is bored with surprising ease. You should withdraw the tool frequently to clear the waste. As you will see opposite, the spindle gouge can be used for a variety of purposes from box hollowing, cutting coves - as it is most commonly known for - as well as forming beads on your turning. 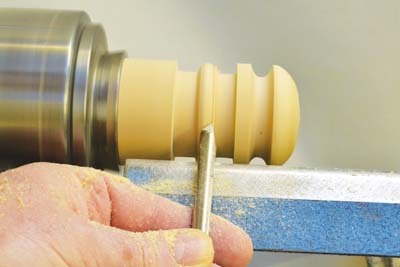 Follow these simple pointers and you can be sure to get the most from this turning tool. As I have stated before, mastering the tools is all just a case of practice. A bead is the opposite of a cove and it should not be surprising that to form a bead the tool movement is the exact opposite of that required to shape a cove. 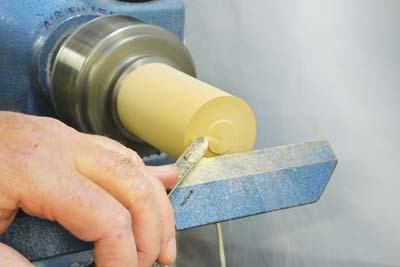 To form a bead, start on the top of the bead with the tool horizontal and the tip of the spindle gouge just in contact. Push the tool forward while rotating it so that when it reaches the bottom of the cut, it is on its side with the tip vertical. The finished bead should be semicircular in shape. Practice, practice!